Handcrafted Multicolored Glass Mosaic Wall Mirror, "Summer Leaves"
Cheerful leaf shapes in sparkling blue, red, and golden yellow cover this beautiful wall mirror presented by Kamal in India. The glass pieces form a mosaic that is set into beige plaster of Paris over wood frame. Square glass tile borders complete the original design. 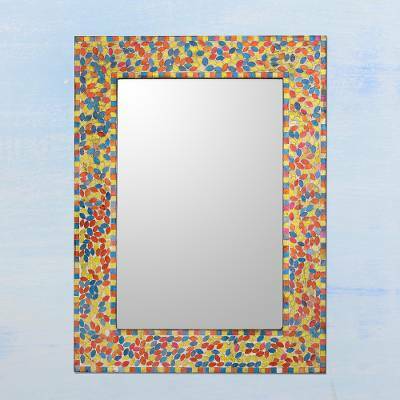 The fun and colorful mirror can be oriented either vertically or horizontally.